E & M Waterproofing, Inc. Comment: Will install above ground pool, 14' x 26' oval. Helical piles going in about 4/7. After helicals, dig trench approx. 3'wide x 2' deep. Connect 6 helicals with re-rod. Pour concrete to a level of approximately 14" in trench. 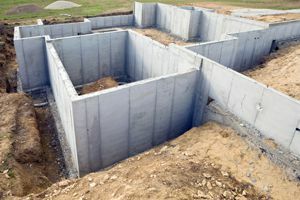 Level concrete. That's it. Comment: I would like to get an estimate for My side wall on the outside of the bottom of my house has a gap and believe there is a leak to my basement. Comment: I would like to get an estimate for basement entrance to commercial building. Large coat separating and water penetration. Comment: I would like to have an estimate for installing some drainage into my basement. Baldwin Foundation Contractors are rated 4.61 out of 5 based on 1,215 reviews of 25 pros. Not Looking for Foundations Contractors in Baldwin, NY?